Police and fire officers enter the ground-floor flat at Tai Wan Tsuen off Tai Mong Tsai Road, Sai Kung, where 45 cats were found in a malnourished state. Forty-five cats, described by a witness as "weak and skinny", were rescued from a village house in Hong Kong on Tuesday, having been left without food and water for at least a week. Police arrested the cats' owner - a 29-year-old woman - on suspicion of cruelty to animals, which carries a maximum penalty of three years in jail and a HK$200,000 (US$25,500) fine. 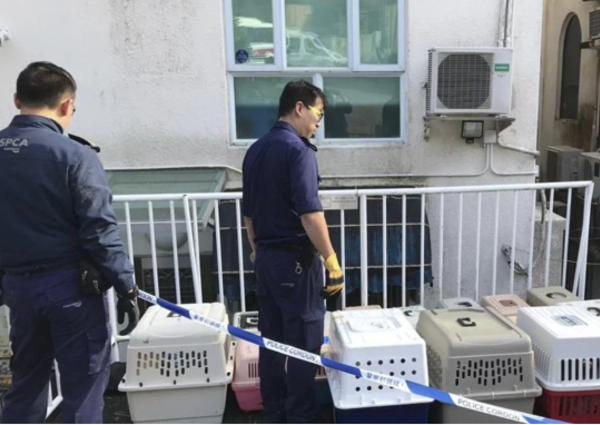 The witness said most of the animals were British shorthair cats and Scottish fold ear cats and they were found wandering around the ground-floor flat of a three-storey village house in Tai Wan Tsuen off Tai Mong Tsai Road, Sai Kung. She said the property had not been cleaned for a long time and hygiene was poor, as the floor was covered in faeces, giving off a strong odour. The cats were removed to the Society for the Prevention of Cruelty to Animals’ headquarters in Wan Chai. Inside the flat, containers used to carry food and water were empty, she said. "The cats are weak and skinny and they had dirty and matted hair," she said, adding that she believed they were emaciated after going without food and water for at least one week. The case came to light on Tuesday when a complaint was filed with the Society for the Prevention of Cruelty to Animals (SPCA), saying some cats were going without food and water in the village house and their owner had not been at home for some time. Police and fire officers were called in shortly before 1pm, when the cats were found to be inside the locked flat. Just as emergency personnel were about to break into the flat, the pets' owner returned home. A police spokesman said the woman was arrested for cruelty to animals. As of 5pm, she was being held for questioning and had not been charged. 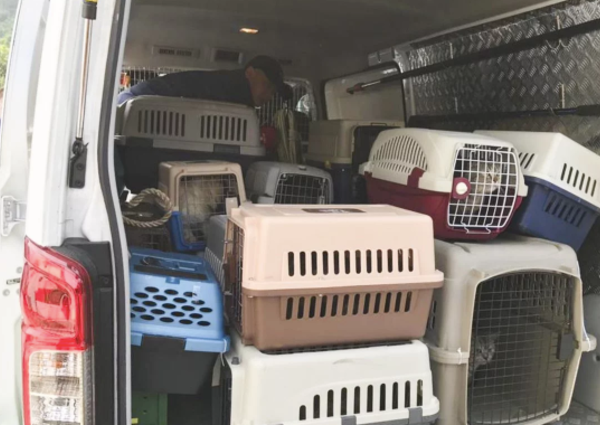 An SPCA spokeswoman said all the cats were taken to its Wan Chai headquarters for examination and the results might be used as evidence in court. On December 27, a group of six people pushed a 63-year-old woman onto the ground and kicked her pet dog - a shiba inu - in a dispute at Fu Hong Street Pet Garden in Chai Wan. On December 19, police arrested a 52-year-old man on suspicion of beating a mongrel with a golf club in Mong Kok.